One of the decisions that we had to make with converting our guest room to the nursery was where to put all the clothes we were storing. We were using two dressers for our clothes – one in the master bedroom and one in the guest room but with Little Miss Baby T arriving in a few short months, we had to face the truth – she deserves her very own room that isn’t full of her parents’ clothes. Move it to the office – Also, not my favorite. I believe every room should have a purpose and you shouldn’t mix and match. In this case, the office should only be an office with computer stuff, reading materials, office supplies, and anything else that relates to an office. It’s a true pet peeve of mine when people use rooms for something other than their purpose. We did try moving the dresser in there but I had such a visceral reaction to the sight of it in there that I couldn’t let the dresser sit there for more than 5 minutes. Move it to our bedroom – Clearly the most obvious choice because it’s our clothes so they belong in our bedroom, but it was not as obvious as it seems… See below for why. Back to my belief that every room should have a purpose, our master bedroom is where we should be storing our clothing but we just didn’t think we had enough room. Our master bedroom is smaller than most and I hate clutter so I was afraid that adding another dresser would make it feel too cramped. To test out the theory, we moved the guest room dresser into our room for a few days to feel it out and surprisingly enough, it wasn’t that bad. There was still enough room to walk around and we didn’t have to shimmy past it to get to the master bath. Sooo we ended up choosing Option #3 because it made the most sense and our “trial run” with the guest room dresser went well. 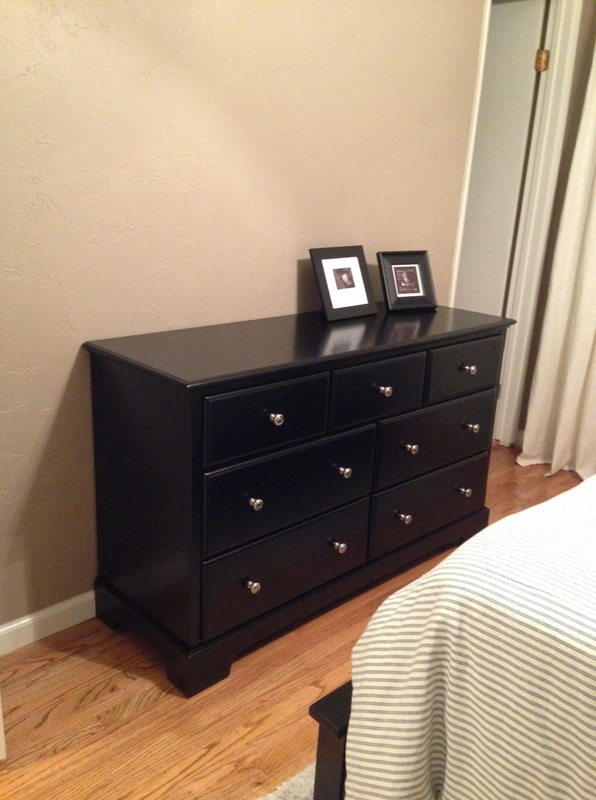 We bit the bullet a couple weeks ago and ordered the matching dresser for our bed set and moved it into its new home. Once we slid it into place along the wall, we looked at it and felt so relieved. CJ turned to me and said, “Wow, we have a real room now!”. I couldn’t have explained it better myself. It really completes the space and feels like it’s always been there. We’re so happy we made the decision to buy it and already love being able to access all of our clothes in our room. It was quite annoying to have to walk over to the guest room several times a day to grab a t-shirt or sweatpants but those days are a thing of the past now! What did you have to change in your house to prep for a baby? This seems pretty minor but it took us several months to decide what to do. So, where is the dresser that you moved into your room from the guest room? I’m also curious about the top picture in the Instagram photos that looks like a toy for Baby T? We brought it to my parent’s cabin. I told you all about that when we were texting about what we did with the bed and nightstand last month. And yes, it’s a teething toy for Baby T. My friend gave it to us. We already had another dresser in our room which we’re keeping there. All the furniture in our master bedroom is a matching set. The dresser that went to the cabin was from the guest room and does not match our bedroom furniture.